I can hold two conflicting thoughts with equal conviction, and I have no problem with that whatsoever. For example: I generally like people who are educated and well-groomed, but I have a soft spot for people that swear with abandon. I like bananas — but not banana-flavored things — and the texture of pudding makes me gag, but I cannot be in the same room with banana pudding without eating every bit of it. 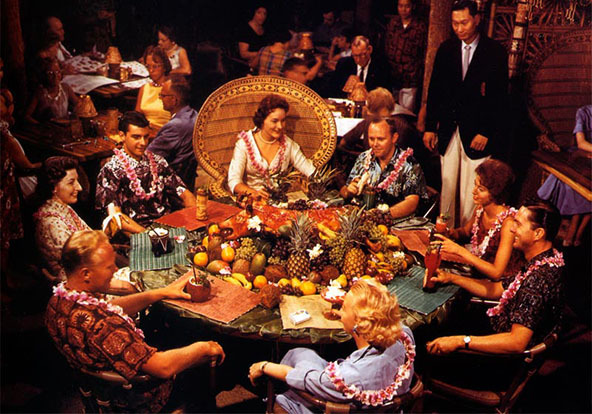 And while I detest hot, humid weather, I’m a sucker for tiki culture and hula girls and recipes from my vintage Trader Vik cookbooks — which were the inspiration for the Tropical Tacos with Jicama Slaw below. Think of these tacos as the food to eat while watching Elvis in Blue Hawaii or planning a trip to Disney’s Enchanted Tiki Room. They’re a balance of sweet and hot, just like a day on the beach. Don’t be frightened of the jalapeño—it’s more flavorful than fiery—and sweet-cool ingredients like mango, carrots, and jicama balance the spiciness of the pepper. In a large bowl, mix carrots, jicama, lime zest, lime juice, and cilantro. Season with salt and pepper to taste, set aside. Separate lettuce head into individual leaves, wash, and set aside. Heat the coconut oil in a large skillet over medium-high heat, then sauté the onion and jalapeño until the onion is translucent, about 7 minutes. Add the garlic, and as soon as it’s fragrant, about 30 seconds, crumble the ground turkey into the pan. Cook until the turkey is no longer pink. In a small bowl, combine the ginger, allspice, salt, and pepper. Add to the pan, and stir until fragrant, then add the coconut aminos and mango. Sauté until combined and the mango is warm, about 2 minutes. 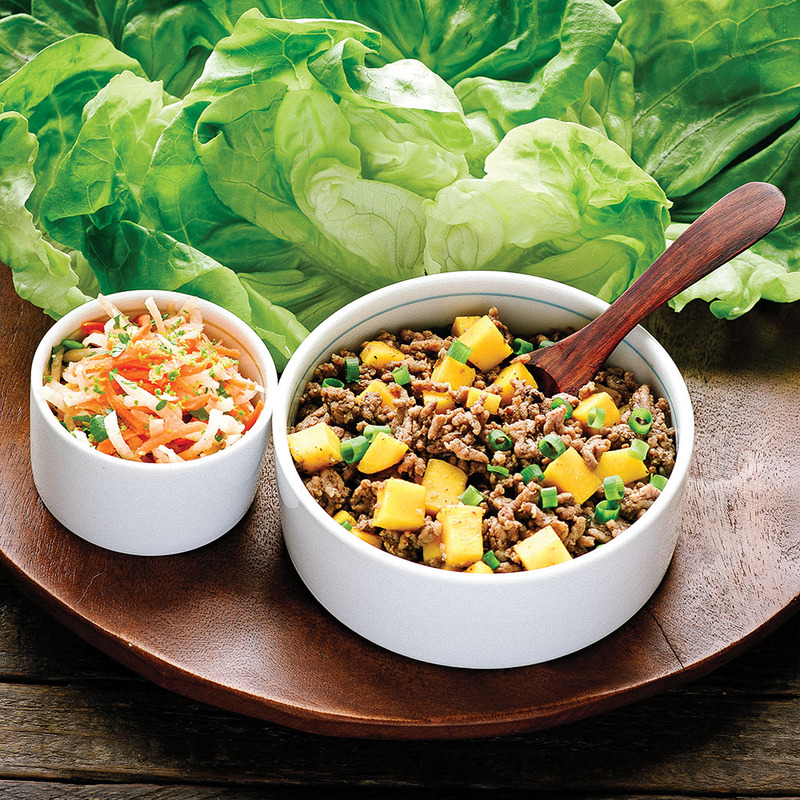 Spoon turkey into individual lettuce leaves and top with carrot-jicama slaw. These look delicious! I cannot resist lettuce wraps, and I also love pink and orange together. I’m definitely making this on Saturday. It looks beautiful, sounds delicious. Can’t wait to eat it. Thank you! I’ll have to try these out. My family CONSUMED the Jicama Home Fries I made last week. I already have another Ziploc of cooked Jicama waiting to go in the pan tomorrow to eat with Nom Nom’s Big O’ Bacon Burgers. Thanks for another great meal share! Glad you found some stuff you like here! Thanks for buying our cookbook — best wishes for an awesome Whole30. For this slaw, you can replace the jicama with red or green cabbage. For jicama home fries, use sweet potato. For jicama potato salad, you could use turnips, if you like them. I’ve got a kiddo allergic to coconut and coconut oil. If I omit these from this recipe do you think it will alter the taste much? Should I substitute something else? Thanks so much! You can use whatever cooking fat you like in place of the coconut oil. For the coconut aminos, either skip them or use the substitute recipe I linked to. Hope you like it! This is one of the BEST paleo recipes I have tried. I put some guacamole on top as well, and I was in heaven! So glad you like it! Thanks for letting me know! Seriously! This is CRAZY GOOD! Butter lettuce and slaw add a perfect fresh, zesty crunch to the fragrant spicy meat. Perfect spring dinner. I am allergic to garlic in any form. Is there a substitute ingredient I could try? I just eliminate it from recipes but I know the taste is altered. HELP!!! Can you eat anything from the onion family? If yes, you might try scallions or shallots. If you aren’t able to eat either of those, the only option is to skip it. Sorry! thie recipe saved my whole 30 last night!!!! I was in such a rut and I pulled this off, although I didn’t have jicama, I did use some cabbage and carrots and it was so good…. Crisis mode over!!!! Congratulations on muscling through a tough Whole30 day! Glad the tropical tacos helped a little bit. I hope the rest of your month is smooth sailing! Congratulations on Whole30-ing! That’s a major accomplishment — hope you had a great month! And I’m very happy my recipes helped make it a little easier. Happy cooking! Enjoy the carnitas.